Discussion in 'Team J' started by CherryBlossom48, Mar 19, 2014. Feni is from Cianjur, West Java.The area is famous of its fine quality rice. My parents is an oldies songs freak, used to play a 1970's legendary pop song "A night in Cianjur" (a web article says it’s recorded in 1965). The melody is just perfect for this holiday's morning. Watching Dangdut Vaganza on channel Indosiar this evening (mostly to watch the funny hosts talkings esp Rina N). From the four hosts, three of them are Capricorn starsign [Rina Nose, Indra Bekti and newcomer Upiak Isil]. It’s not coincidence. TV producers seem to favor the capris thanks to their flexibility, likable, charming, friendly, natural and endurance. Their presence aren’t intimidating. As my fav hosts and funny people on tv are the capris: Ivan Gunawan, Denny Chandra, Azis Gagap, Eko Patrio, Uus, Gracia Indri, Rina Nose, John Martin, Ki Daus [he’s born Dec 25 as Desy jkt]. This certainly doesn’t mean others are bad. There are level like great, good and fairly good among them. Those mentioned above have set standard of entertaining tv host and I see nowadays the ones who used to appear as host/cohost with less natural trait are difficult to get job. 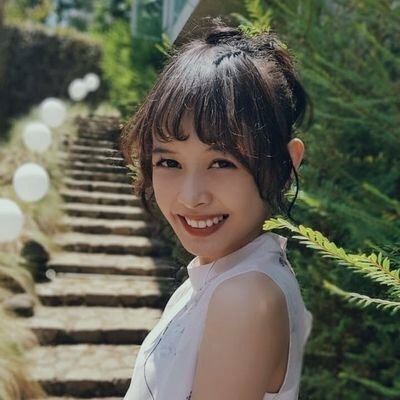 I wish jkt48 capris like Anin & Feni have opportunity to be on tv occasionally eg. invited by The Comment Net TV, CNL, ITS. I once read Anin wants to be recognized on television too. If jot produces jkt members dolls I will pick the Feni one ... then give it to my niece. I don't play with doll ofc. Feni is the girl in the back clinging and cuddling Haruka. What a lovely moment. Harugon’s cute “daughter” Feni, May 28. They rarely meet each other nowadays. 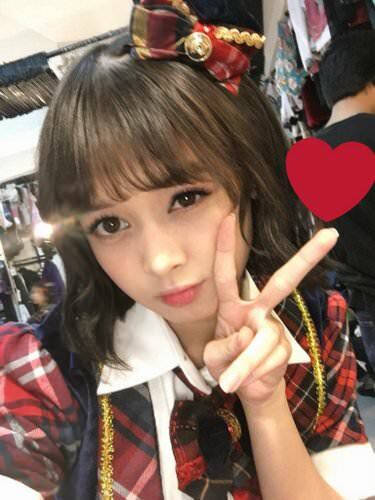 Mpen's (Feni) birth date is the same with Rina Nose, January 16. Rina is one of my favorite funny people on tv can be an inspiration for Feni [same Sundanese too]. 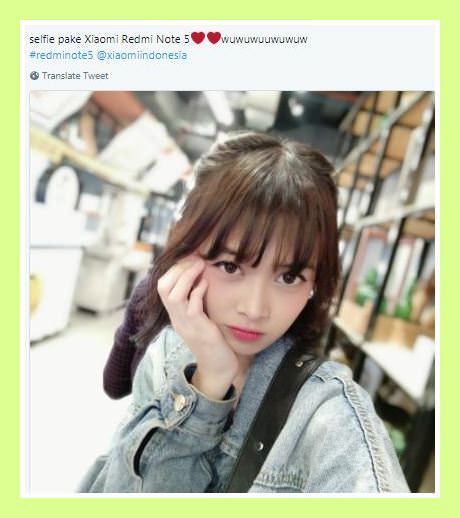 I read her tweets Rina is an art college graduate and aimed to be a film actress and singer. After a long journey and process she adapts/compromises with the reality in entertainment world and now she becomes one of very talented presenter and comedian. 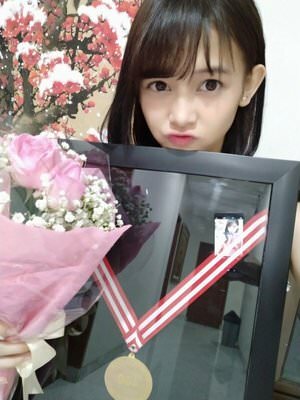 I know from years ago she wasn't that funny but with heavy experiences Rina is now skillful also thanks to her Capricorn natural, likable and endurance traits plus her rows of specific numbers. Date 16="7"=unique ; Date+Month 16+1="8"=likable. 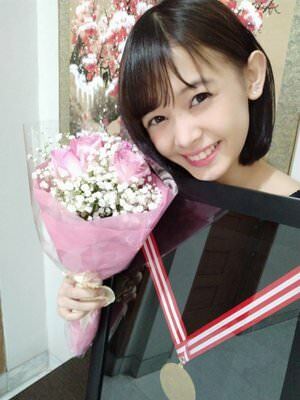 Spotted Haruka congratulating Matsuoka Hana week ago in twitter after the Sekai SSK announcement. Maybe Hana reminds Haruka with Feni? [Feni was a team T member where Harugon as the leader]. Hana's same star sign too with Feni. 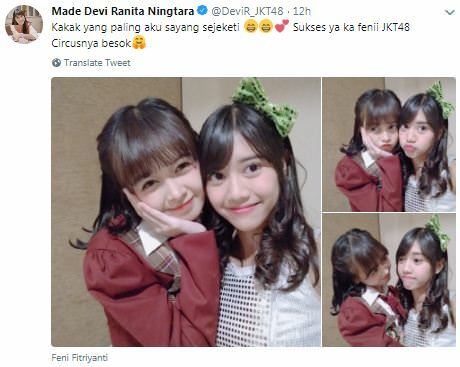 A nice one from Devi Ranita of team T saying Feni as her most beloved big sister in all jkt48. Feni after her 400 theater shows. Watching Mpen's birthdate twin, Rina Nose on tonight’s Opera van Java show doing various impersonations just like that made me realize how great is her talent in entertaining. These days after appearing in OVJ then in next couple of hours Rinose being in KDI 2018 MNCTV as a judge. It means there's still slot for tv personality with her type. Naturally, Feni with no make up put on she's really still look like a cute child. and here with some makeup working she appears maturer in her current 20 yo.